If you didn’t make it to this week’s Rotary Club of Forest Grove meeting, below is an overview of what you missed. Crab Feed – Thank You! :We want to thank everyone who took part in our annual Crab Feed on Mar. 27. Special thanks to the Crab Feed Committee of Mike Hundley, Jeff Duyck, John Welch, Mary Welch and Ron Brandt for their work to put the event together. Thank you as well to Michelle Thomas for organizing the silent auction (see below) and to our entertainers for the evening, Pamelajean Myers and Maggie Richardson. Silent Auction At The Crab Feed: We were able to raise $1,420 that will directly benefit The Rotary Foundation. Thank you to all who bid on and won the items and a special thank you to our donors: Julia Kollar, Coni Ingram, Claudia & Michael Yakos, Tim Pearson, Parri Van Dyke, Andrea Stewart, David Hill Vineyard and Pacific University. Maggie Pike Wins Mike Ward Community Service Award: At the Crab Feed, we were honored to present Maggie Mike with our Mike Ward Community Service Award. Presented to a non-Rotarian whose service to the community embodies the Rotary ideal of Service Above Self, Maggie has given of herself and her talents in the Forest Grove community for over two decades. She used her restaurant, Maggie’s Buns, to help many community causes and individuals. While Maggie sold the Bun House and retired last year, she still volunteers her time throughout the community. Congratulations, Maggie, and thank you for all of your service to Forest Grove! Congratulations Paul Harris Fellows: At the Crab Feed, the following individuals were presented with Paul Harris Fellowships, honoring continued giving to The Rotary Foundation and Rotary International. New Paul Harris Fellows: Parri Van Dyke, Becky Chasse (presented by Jim Crisp), Amanda Yakos (presented by Claudia & Michael Yakos) and Michael Yakos (presented by Claudia & Michael Yakos). Multiple Paul Harris: Blake Timm (+1), Jim Crisp (+2), Jeff Duyck (+2), Julia Kollar (+2), Jeannine Murrell (+3), Jerry Hoerber (+4), Tom Raabe (+4) and Claudia Yakos (+6 and +7). District Training Assembly: Make plans to attend this year’s District 5100 Training Assembly. This year’s annual Rotary training event will take place on Sat., Apr. 13 at Centennial High School in Gresham. The DTA provides over 50 different classes on all different aspects of Rotary and Rotary leadership. Anybody who will be in a club leadership position, or anyone who is interested in learning more about Rotary works, is highly encouraged to attend. If you are interested in attending, please contact Tim Pearson. 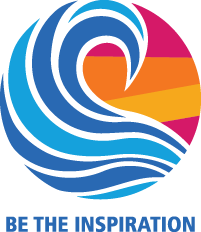 District Conference: Mark your calendars for May 17-19 for the District 5100 Conference, which will take place at the Riverhouse on the Deschutes in Bend. More details about this year’s conference are available at https://www.district5100conf.org/. Peace Village: Our club and the Forest Grove Rotary Daybreak Club have both received District 5100 Matching Grants to help towards our club’s joint Peace Village project. The camp, which will target middle school students in teaching skills in conflict resolution, media literacy, connections with nature and mindfulness, will take place in August. The project is a joint between our Rotary Club and the Forest Grove Daybreak Rotary Club. If you are interested in learning more or getting involved in the planning process, see Loren Waltz, Blake Timm or Julia Kollar. To learn more about Peace Village, Visit Their Website. Rotary Foundation Update: We are well on our way to meeting our Rotary Foundation giving goals! To date, club members have contributed a total of $8,107 towards The Rotary Foundation towards our annual goal of $9,000 (this does not include Crab Feed silent auction proceeds). We have surpassed our PolioPlus goal of $1,500 with $2,238 raised to date. Thank you! Have A Program Idea? : We have made the transition for program chairs with Julia Kollar starting her term. If you have an idea for a program or would like to present something yourself, let Julia know. She will also have a program planning board at meetings so you can see what is on deck and what dates may be available. Cassie Peters, a current student at Portland Community College, intends to transfer into Pacific’s Dental Hygiene program in the future. She has two young daughters and is involved in many activities. Cassie was one of two participants in RYLA last year sponsored by our club (Duncan Stewart was the other). She talked about her experience at the one-week intensive camp for young professionals and how it changed her and her future focus. 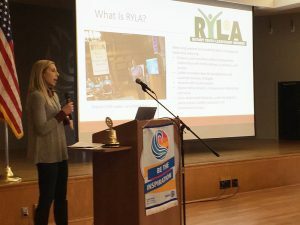 RYLA (Rotary Youth Leadership Awards) is a one-week program for young professionals held annually at Camp Menucha in the Columbia River Gorge. Designed for young professionals ages 18-29, the purpose of RYLA is to recognize young leaders and provide them with an opportunity to expand their perceptions and ideals. Our club is looking to sponsor two participants for this year’s District 5100 RYLA, which will take place July 13-19. The application deadline is May 31. Participants are accepted in the order they are received, so timing is critical. If you know of a potential applicant, please have them contact Loren Waltz. 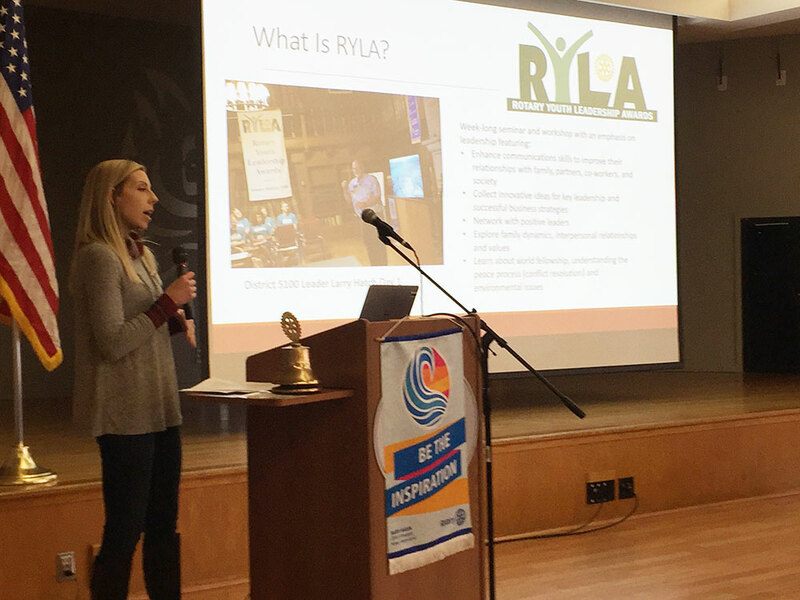 More information on RYLA is available at ryladistrict5100.org. Next Week’s Duty Roster: Make note of your assignment! This entry was posted in Rotary Rewind. Bookmark the permalink.